In the Oxford Times - "Country artists' work is in a top exhibition", Sarah Mayhew Craddock writes: "It is Cave's exquisite pencil drawings and wood engravings that often describe various types of wooden forms that capture my imagination, and it is pleasing to see that one such work, Where Late the Sweet Birds Sang... is on display in the Summer Exhibition." Sue Cave trained at Grimsby School of Art and Kingston-on-Thames College of Art and Design. On completing a BA Hons in Fine Art, she moved ­to Oxford and has lived and worked in Oxfordshire ever since (see Biography). Sue works in oils, water-colour and various drawing media as well as wood engraving. 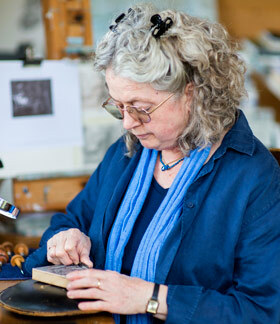 She presently shares a studio complex with five other artists at Kirtlington Park. Sue’s work has been shown at various galleries and museums including the Piccadilly Gallery, London; Christ Church Picture Gallery, Oxford; Oxfordshire County Museum, Woodstock; Halifax House, Oxford; Plymouth Art Gallery and Museum; the Royal Academy Summer Exhibition; the Fine Art Society, Glasgow; Devizes Art Gallery and Museum; the Parco Gallery, Tokyo; Bankside Gallery, London; and the Jerwood Space, London. Sue has specialised in painting harpsichord lids and soundboards, including a new instrument commissioned by Magdalen College, Oxford. Other commissioned work includes portraits, murals and landscapes. Her ink drawings have been printed in various private press publications, such as Simon Rae’s "Calendar" (Redlake Press, 1990) and "Listening to the Lake" (Previous Parrot press, 1993). A pencil drawing (Nevergreen Oak 1) was selected for the Jerwood Drawing Prize Exhibition 2009 and the subsequent Jerwood touring exhibition. Alongside her studio work, Sue teaches drawing and painting in adult education classes. She previously taught at Oxpens College of Further Education and now takes a weekly private class at the Tew Centre in Great Tew. Sue Cave holds weekly art classes on Thursdays at the Tew Centre, Great Tew near Chipping Norton. There are currently a few places available for the Spring term, beginning 31st January 2019.